As one of the main pillars of support for Stalin’s regime, the Soviet state security organs had a prominent role in both the state authority’s and the Party’s nomenklatura system. The principle of the nomenklatura system – to establish the control of Party organs over the appointment of leading cadres – was introduced in the Estonian SSR immediately after its annexation in 1940. 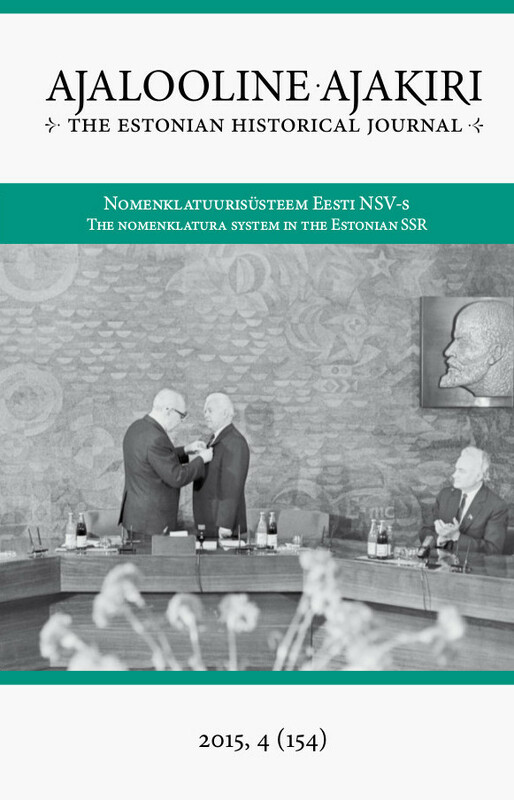 This article considers the development of the nomenklatura of the state security organs at the Union republic level, the implementation of the nomenklatura system, and the role of the state security organs in this on the basis of the example of the Estonian SSR in the years 1940–53. It clearly appears that changes in the composition of the nomenklatura, yet also in the individuals filling posts that belonged to the nomenklatura were as a rule initiated not in Estonia but in Moscow in the CPSU Central Committee and in the headquarters of the state security organs. Here the role of the Estonian SSR Party apparat was formal. For this reason, essentially no rights emerged for the Estonian SSR Party apparat to appoint state security leaders to their posts nor did any patron-client relationships develop. In actuality, the role of the Estonian SSR Party apparat was limited to that of the informer and – if necessary – of the institution that had to answer for any conceivable consequences. The strictness with which Estonian Party authorities followed the nomenklatura system depended primarily on what the attitude and regulations of the CPSU Central Committee were at any given moment in relation to this matter. When the order came from Moscow to follow the nomenklatura system more strictly, that is just what was done. With isolated exceptions, non-Estonian cadre officers sent to Estonia from the Soviet Union formed the personnel subject to nomenklatura in the state security organs of the Estonian SSR. The fact that the state security organs carried out background checks not only on their own nomenklatura officials but also on those of other agencies, including those in the Party apparat, increased the independence of the state security organs even further. Considering the centralization and dictator-like control with which the state security organs were run, this was also most likely the intentional policy of the Kremlin, meaning that patronage relationships between the local Party and the leadership of the state security organs were considered undesirable. Instead, rivalry and denunciations were preferred. It appears that the state security agency also did not welcome or encourage actual intervention by the EC(b)P Central Committee in their cadre work. When the situation became problematic, it was always possible to refer to the covert nature of the state security organs. The fact that the approval of the heads of state security had to come from Moscow also essentially gave them independence in relation to the local administration, including Party authority. Keywords: nomenklatura, Stalinism, Estonia, Soviet state security organs.